And there were a hundred other things that nearly destroyed my life and marriage. Would you care to guess who my MAIN teacher was? Who I followed as if he himself were Jesus? Who I tithed to regularly? Who’s books I read faithfully? Who’s sermons I purchased? Who’s dress I imitated? Yes, you guessed it. TD Jakes. Now, not everyone has had the same experience as Sean and Amber. And not everything in Sean’s experience can be attributed to the preacher. But we can’t deny the connection between belief and behavior. If the belief is faulty chances are the behavior will be faulty also. Picture Sean. Picture many more like Sean, falling into life-changing and sometimes life-threatening behaviors because they’ve believed a self destructive and erroneous teaching. This story hit home and like Sean and Amber,there are tons of people who have been “victimized” by wolves like these. My heart goes out to those who have fallen away from the faith because of these lies. Although there is a responsibility for the people in these churches to read the bible and test what is coming out of these wolves mouths, only God was able to open my own eyes to what I,too, was neck deep in. Thank you for sharing this article and your thoughts. Pls there is different between faith & foolishness. You should know that once it comes to issue of faith you must secure absolute conviction personally. If you are still having some element of doubt you go take your medications especially if the sickness is what medical science can handle. It is the work of hand that God will bless.If you don’t have a Job how do want God to bless you. God does not encourage laziness. The problem is not with T.D. Jake but you who refused to grow up. You must mature & work out your Salvation. What is so wrong with the biblical quote “Whatsoever thou doest shall prosper”? 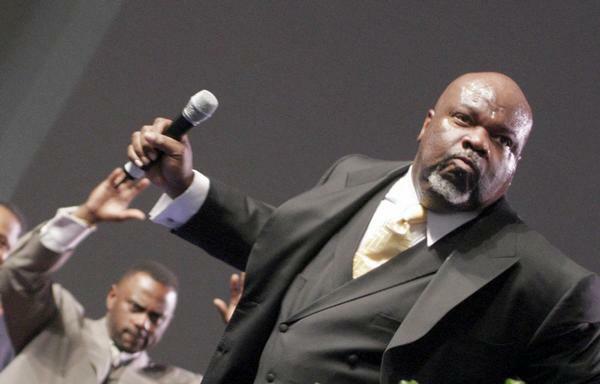 I listen to Bishop Jakes from time to time, but I am the preacher of my house. I have never heard Bishop Jakes say to beg God for anything. Follow principles and blessings will naturally fall upon you. Eat right and exercise and there is good chance you will be healthy. Work hard , save some of your money and don’t be wasteful and your resources will grow. Do good and good things will happen to you! If you didn’t want to work waiting for GOD to bring you something ” Come on man and get real” ! If you are sick, you go to the doctor, we learned that as kids! If someone convinces you to stop thinking, who’s fault is that really! So as you think, so shall you become. uhhh they ..meaning prosperity preachers and Word of Faith don’t believe like that..they believe you SHOULD go to doctors…they even teach in their sermons that going to the doctors does not mean you don’t have faith in God..they teach go to doctors.